If you use Gmail as your primary email client, Opera 10 makes it easy to associate any mailto links that you might encounter to use Gmail as the default email client. All you need to do is make one small modification to one of the .ini files. Instructions are included for both Windows and OS X. 1. Close all open Opera windows. 2. Open Windows Explorer and go to C:\Program Files (x86)\Opera\defaults (64 bit) or C:\Program Files\Opera\defaults (32 bit). 3. Find the webmailproviders.ini file and double-click on it to edit. Alternatively, you can right-click on the file and choose Edit. 5. Save the text file. 7. Click the Opera icon on the top left of the window and then choose Settings -> Preferences. 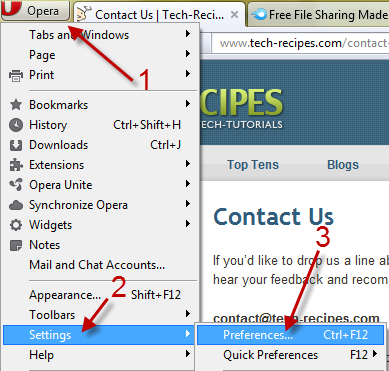 You can also use Ctrl + F12 to access the Preferences page. 8. 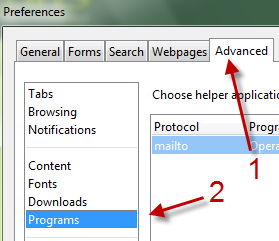 Go to the Advanced tab and then choose the Programs section of the left side of the window. 10. Choose Use a webmail service and select Gmail from the list. 11. Hit OK to save the setting and then close all other options window. 1. Open Finder and select Applications. 2. Right click the Opera icon and select Show Package Contents. 4. Find the webmailproviders.ini file and open it with TextEdit. 7. Open Opera and go to Preferences. 10. Select mailto from the Protocol list. 12. Select the Use a Web mail service radio button and select Gmail from the dropdown.